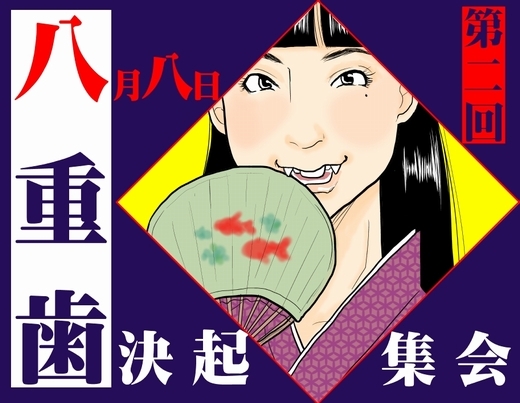 The latest cosmetic dentistry trend out of Japan is “Yaeba”: Vampire Teeth. Dental Salon Plaisir, located in Tokyo's upscale Ginza district, specializes in this cosmetic procedure that lengthens, sharpens and enhances one's canines to fang-tastic proportions. Vampires have been called many things: scary, bloodthirsty, evil, cute... wait, what? For some odd reason, in Japan “Yaeba” (??? ), or “double tooth” is said to add cuteness to one's smile and make one more attractive – and not just to some Dracula-type dude or dudette who's feeling a tad anemic on a moonlit night. Dr. Yoko Kashiyama and her staff offer Vampire Teeth as just one of their many diagnostic, hygienic and cosmetic dentistry services though she seems to be pushing Yaeba of late – must be the season (of the witch?). At least one Japanese TV network has featured the procedure by sending a roving reporter to Dental Salon Plaisir... not merely to report on Yaeba, but actually get it done! As you can see, Yaeba is pretty mild compared to actual vampire fangs as depicted in horror movies and pop culture. It's more like a cosmetic enhancement, and we should mention that Yaeba as performed by Dr. Kashiyama at Dental Salon Plaisir is purely cosmetic. Much like “falsies”, these vampire teeth are fastened to the patient's canine teeth with non-permanent adhesive. The enhancements are tailored for fit like a glove... and are applied in much the same manner. So what do you think, fellow trend-watchers? Cute, kooky or just plain spooky? Like it or not, Yaeba has been around for a while and this latest boost in visibility sets it apart from more typical Japanese trends that suddenly appear and, just as suddenly, vanish. This is the latest cosmetic dentistry trend to hit Japan, "vampire teeth". So what do you think, fellow trend-watchers? Cute, kooky or just plain spooky?